UOG Sea Grant’s mission is to integrate and apply research, extension, and education activities to sustain and develop island environments while integrating knowledge and cultural perspectives of the island’s people. Within the Mariana Islands Archipelago, coastal environments are dynamic ecosystems with fluctuating water levels, many species of fish, birds, plants and other wildlife, and diverse habitat types. Recreational and commercial use of coastal resources–our watersheds, beaches, reefs, and open ocean–all present challenges to maintaining our ecosystem’s health. UOG Sea Grant addresses issues that can pose ecosystem challenges through research, education, and outreach. Our strategic plan provides an overview of the types of issues we are looking at. Bridging connections between government agencies, nongovernmental organizations, educators, business owners, and other citizens on responsible and sustainable shared resource use. The National Sea Grant College Program is a partnership between universities and the federal government’s National Oceanic and Atmospheric Administration (NOAA), an agency within the Department of Commerce. The Sea Grant network includes more than 3,000 scientists, engineers, public outreach experts, educators, and students from over 300 institutions, representing 33 programs in states and territories. Sea Grant’s mission is to provide integrated research, communication, education, extension and legal programs to coastal communities that lead to the responsible use of the nation’s ocean, coastal and Great Lakes resources through informed personal, policy, and management decisions. Examples of research that Sea Grant helps to fund include: population growth and development on the coasts; preparation and response to tsunamis; human interactions with the marine environment; fish and shellfish farming; seafood safety; and fisheries management. Communication, education, and extension professionals then share the research with stakeholders in a way that is understandable and meaningful. Sea Grant is a national initiative, but is managed and implemented locally. Hence, a program in the Great Lakes region will be very different than one in Puerto Rico, Louisiana, California, or the Western Pacific. The consortium aims to close what it terms an "implementation gap" between the phases of research and on-ground solutions. (Downloadable files: Island Investigations, Charting the Mariana Islands, Mariana Islands cards). SNORKEL INTROS FOR ADULTS (Sun., 12/17 and Sat., 12/23). Not confident in the water but always wanted to try snorkeling? This snorkel intro, with a high supervisor to participant ratio, allowed adults to learn about snorkel gear, try and adjust it, defog a mask, breathe with a snorkel, and kick with fins. Participants could learn at their own pace in a calm environment with water safety pros. NÅ’AN GUIHAN SIHA: CHAMORRO FISH I.D. (Sat., 11/19/17). This family-friendly workshop reviewed scientific and Chamorro organism classification systems and Chamorro names for animals found in the bay. Participants then played a special version of fish bingo to practice both their fish identification and Chamorro skills. YPAO BEACH SNORKEL FOR ADULTS (Sun., 11/12/17). Open to anyone but especially those adults who need a buddy or a water safety pro for assistance, this adult snorkel event at Ypao have participants a chance to practice coral and fish identification in-water. A collaboration with the Guam Community Coral Reef Monitoring Program. FINA’NÅ’GUEN PESKADOT: FISHING EXPO FOR FAMILIES (Sat., 10/14/17). For the Guam Museum’s monthly Ha’ånen Familia, fishermen demonstrated various styles of fishing: chenchulu, spear, jigging/rod & reel, and talåya. A collaboration with Western Pacific Regional Fishery Council, Guam Museum and Humanities Guåhan. SNORKEL INTRO FOR ADULTS (Sun., 9/17/17). To support Humanities Guåhan‘s Hita I Hanom (Water/Ways) exhibit, contributor Marie Auyong led a snorkel intro at the Dededo Pool. Participants learned to: fit a mask, defog it, breathe with a snorkel, adjust fins, and practice efficient kicking. A collaboration with Humanities Guåhan. “CHASING CORAL” SCREENING AND MINI-EXPO (Sat., 9/9/17). This movie captures one team’s quest to document coral bleaching on Australia’s Great Barrier Reef system. A panel discussion afterwards discussed what local scientists and agencies are doing to address coral bleaching. Participants could visit tables afterwards to learn about local volunteer opportunities and projects. Sponsored by the Guam Community Coral Reef Monitoring Program. KID’S AUGUST SALTWATER FISHING CLINIC & DERBY (Sat., 8/5/17 and Sat., 8/12/17). Derby competitors ages 7-12 could practice tying knots and casting at the Mangilao Mayor’s Softball Field. Thirty seven children competed in the derby, where they vied for prizes in the following categories: most fish, longest fish, and longest pulonnen (triggerfish). A collaboration with the Department of Agriculture. HITA MUSEUM TALKS: REALIZING THE SIGNIFICANCE OF WORLD WAR II UNDERWATER CULTURAL HERITAGE IN THE ASIA PACIFIC REGION SYMPOSIUM (Sat., 7/22/17). 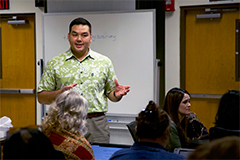 Maritime archaeologists, conservators, educators, and resource managers from Palau, the Philippines, Indonesia, Australia, and California gave 20 to 30-minute presentations on underwater heritage management, 3-D photogrammetry, cannon conservation, artificial reefs, and World War II sites in Chuuk and Guam. Sponsored by the Guam Museum. KID’S JULY SALTWATER FISHING CLINIC & DERBY (Sat., 7/8/17 and Sat., 7/15/17). Derby competitors ages 7-12 could practice tying knots and casting at the Mangilao Mayor’s Softball Field. Thirty children competed in the derby, where they vied for prizes in the following categories: most fish, longest fish, and longest pulonnen (triggerfish). A collaboration with the Department of Agriculture. EPSCOR COLLOQUIUM: MICROBIAL DYNAMICS OF HAWAIIAN FISHPONDS (Thurs., 7/13/17). Dr. Kiana Frank, native of Kailua, Oahu, is an Assistant Professor in Pacific Biosciences Research Center at the University of Hawai’i at Mānoa. She explained how Hawaiians have refined a fishpond aquaculture technique and how stories inform the development of scientific hypotheses. She also presented her research about how microbes influence the health and sustainability of Hawaii’s natural resources. SNORKEL INTRO (Sat., 6/24/17). In the comfort of a calm swimming pool with safety pros, participants learned to defog a mask, breathe with a snorkel, and practice safe snorkeling. Sea Grant provided masks, snorkels, and fins. KIDS’ FRESHWATER FISHING DERBY AND NATURE WALKS (Sat., 4/8/17). Derby competitors 5-16 years old were welcome to the Masso Reservoir for a day of fishing for ahgao and umatang. Other activities included guided walks to learn about the area’s native trees and plants for åmot (Chamorro medicine) and two stations where people could make their own hook/line fishing gear and learn about non-hook and line fishing set-ups. A collaboration with the Department of Agriculture. SCIENCE SUNDAY: LIFE HISTORY PARAMETERS AND THE EVOLUTION GENETIC STATUS OF ANGUILLA MARMORATA FROM GUAM (Sun., 1/15/17). Sean Moran, a UOG graduate student in Biology and Sea Grant Fellow, researches life history and genetics of a Guam freshwater eel (Anguilla marmorata). Learn more about this species, which comprises a valuable island subsistence fishery. Sponsored by Guam Community Coral Reef Monitoring Program and National Park Service. RIOTERS SEMINAR: PHYLOGENETICS OF THE CATADROMOUS EEL, ANGUILLA MARMORATA (Wed., 9/14/16). Sean Moran, a UOG graduate student in Biology and Sea Grant Fellow, researches life history and genetics of an eel living in Guam’s streams (Anguilla marmorata). 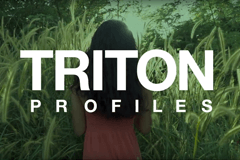 Sponsored by the Biology Program, RIOTERS stands for “Research Integration of Teaching, Education and Sustainable Resources” and happens every Wednesday at 5 p.m. in the Science Building, Room 306. UOG Sea Grant is an active collaborator with the Guam Nature Alliance, a group of governmental and nongovernmental representatives who coordinate activities that enhance public knowledge about Guam’s natural resources. These activities are usually free or very low cost; sometimes transportation is provided to locations. For more information about upcoming activities, check out the Guam Nature Alliance Facebook page here. You do not have to be a Facebook member to look at the page.Among its many diverse members, the Guam Nature Alliance includes representatives from the Guam Department of Agriculture, the Bureau of Statistics and Plans, Guam Environmental Protection Agency, Guam Waterworks Authority, and the Guam office for the National Oceanic and Atmospheric Administration. The University of Guam Sea Grant requests proposals to fund research in Guam, CNMI and the Freely Associated States for one-year projects. Projects should be directly relevant to the goals of the UOGSG Strategic Plan (2018-2021). Research projects within this region focused in one or both of two areas will be considered: 1) healthy coastal ecosystems; and 2) environmental literacy and workforce development. An estimated $85,000 will be available to support 2-3 research projects over a one-year funding period. Researchers may request between $20,000 to $40,000 in federal Sea Grant funds. Successful proposals will have a start date of July 1, 2019 and an end date of no later than June 30, 2020. 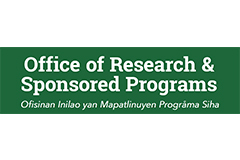 Researchers at institutions of higher education and organizations or agencies that conduct research in Guam, CNMI and the Freely Associated States are eligible to respond to this RFP. The research conducted must demonstrate the benefits it provides Guam. For more information on the call for proposals, click here.